Food Costs > How Much Does Lasagna Cost? How Much Does Lasagna Cost? 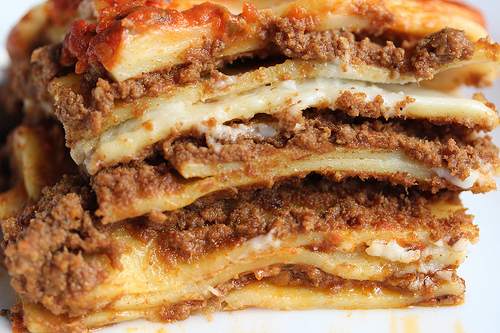 Lasagna is a layered pasta dish that is often cooked in the oven; it is topped with cheese and stuffed with meat between its layers. Lasagna can come in many different forms, whether it is straight from a can or prepared fresh using different ingredients such as noodles, meat, cottage cheese, peppers, spices, and more. A homemade lasagna will cost $15 to $40 once you factor in all the ingredients if you don’t have any. This will depend on the ingredients being used and which brand of ingredients you will buy. Refer to the table below if you were to make it homemade. Organic ground beef will be three to four times more than purchasing non-organic. Frozen lasagna can be purchased pre-made in boxes that have everything included and only needs to be thrown in the oven for as little as an hour. These premade boxes, depending on the brand, can cost anywhere from $10 to $25. Most of the time, you will get more than one box in a package. For example, Omaha Steaks sells a tray for $9 to $15, while Stoffer’s lasagna with meat sauce retails for $9. Costco lasagna, which is known as the Kirkland Signature Lasagna, retails for $17 and includes two three-pound packages. Michael Angelo’s, another popular retailer found in many grocery stores, retail for about $7. As for restaurants, the costs will depend on the size, which type and restaurant. Common offerings can include meat, veggie or cheese only. To feed a party of 15 to 20 people, the costs of a full pan can be anywhere from $55 to more than $100. If you were to make it from scratch and didn’t have any of the ingredients, the costs would be noted below based on the #1 lasagna recipe found on the Internet — World’s Best Lasagna on AllRecipes.com. As you can see, if you were to buy everything, you would have to budget about $35, bringing it down to about $2.91 per serving for 12 total servings. The costs can vary depending on the recipe you create. A 9×13 lasagna pan is needed if you plan on purchasing it at home. Spray the pan with a simple cooking spray before placing the ingredients in since this is going to stop the lasagna from sticking when taking it out. For a lot of flavors, consider adding a pinch of garlic to the recipe. If the recipe calls for something such as olive oil, consider getting authentic olive oil for added flavor. While most recipes are going to call for stock noodles in the store, consider making the noodles on your own by using a pasta maker. If the recipe calls for canned tomatoes, consider using chopped up fresh ones rather than using the can. The same can be said about peppers and herbs. Ready to eat lasagna will have the serving tray included and once prepared, it can simply be cut and served. Most frozen boxes, regardless of the brand, will have to be baked at 350 degrees Farenheight for up to 60 minutes. I use bechamel instead of cottage cheese or ricotta.